I'm fascinated with Phoenix history. And not just memorizing names and dates, but living it, as if I were really there, in territorial times, or back when gas was 18 cents a gallon. I call it time-traveling, and it's a lot of fun. And sometimes I get a chance to see Phoenix history through the eyes of someone who has lived it. I made a point of visiting Jimmy Desmuke in 1994. He had been one of the executives of Valley National Bank going back back to the time of Walter Bimson. Jimmy was in his nineties then, and he had asked for only one thing when he retired, in the mid-1960s, an office which he could keep going to. 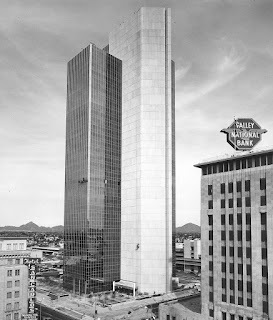 And he had a nice, big, private office in Valley Center (which was the Bank One Building then and is now Chase Tower), where I worked, on Central and Monroe. So I visited Jimmy one day. I called and asked for an appointment (yes, he had his own secretary) and then got on the elevator to go see him. I didn't stay very long, and there really wasn't much to say. I already knew about him, and about the history of the bank that he had helped to become so successful. I just wanted to shake his hand, and I did. And for a brief moment, I could see it all through his eyes. Image above: Valley Center under construction in 1972, across from the original headquarters for Valley Bank, the Professional Building, Central and Monroe.